A few weeks ago my cousin Sam picked out a chainsaw (a Husqvarna 55, or a "Husky" as we woodsmen call them) and some gear for me. At first I was a bit skeptical - it seemed like a lot of gear. However, the more I read and talked to people, the more I realized that this was a dangerous tool, and that I'd better Wear the Gear. This is me wearing the gear. Laugh all you want, but I felt pretty tough in my Kevlar chaps. 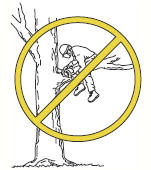 Managing a chainsaw requires some common sense (as the manual indicates here) but there are some good lessons and practises to learn before trying anything. My first tree falling did end up scaring me. I'd picked a falling direction, and also ensured that if it were to fall in the opposite direction the way was clear. An opposite direction fall is always possible, as the "hinge" you create by notching on one side then cutting into the other promotes a fall along a 180-degree path. Your goal is to have it fall towards the notch. In this case, however, I'd mis-judged the tree's centre of gravity, and late into the cut towards the notch, the tree leaned backwards. Not a lot, but enough to pinch the saw blade. With my heart thumping in my ears and sweat burning my eyes (Kevlar chaps may look cool, but they are hot!) I flicked the saw's switch to off and leaned against the tree towards the notch, trying to pry the saw out. The tree was heavy (I'd guess over 500 lbs) and not easily swayed, but I was first able to get the bar out, then another push freed the chain too - somehow without damaging it. The tree then fell, exactly away from where I'd intended. All this happened in about 5 seconds. I recovered by picking and eating some nearby Saskatoon-berries. (Joanne's right - they are pulpy, mealy, seedy and taste vaguely of pine tar, yet they are delicious!) I was then able to limb the fallen tree, gather up the logs, and do the same to a second tree that DID fall where I'd planned. I have a lot of trees to clear, but I'll be waiting for cooler weather. There's no rush - we have stockpiles of beetle-killed pine all over, good enough for ten years of firewood we figure - so the only urgency is to clear land for whatever beast Joanne come home with next. Very nice Erich, I like the co-ordinated orange helmet, chaps and chainsaw! It's a good idea to take care - you only want to cut the trees, not yourself. Happy sawing! The camera missed the subtle detail - who knew there were three (that I know of) different shades of neon orange? I did a lot of woodcutting in my youth, actually - my house was half-heated by a wood furnace. 1) Don't try to get a chainsaw unstuck by running it out (i.e. pulling the trigger). Kick-back could be very dangerous. Sounds like you didn't do that, so that's good. 2) Pine for firewood? Stick with hardwood. Pine burns super-fast and can actually be a hazard if it has too much sap.